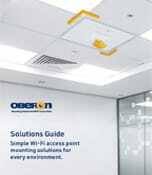 Oberon’s partners provide comprehensive wireless LAN integration solutions using Oberon products. Oberon’s partners are comprised of regional Network Designers and Installers (NDIs), National Integrators and Distributors. The NDIs provide regional integration services to small and medium sized businesses. The NIs provide enterprise integration services to larger institutions and federal customers. Distributors provide product access and logistical support to NDIs and NIs.